Over the past several years as I have discussed The Climate Fix and the "iron law" of climate policy, someone often brings up the Easterlin Paradox as a counter argument. There are several reasons why it fails to contradict the iron law, the most important one being -- it is just wrong. ... Richard Easterlin of the University of South[ern] California, has been studying the concept of national happiness since the 1970s, when he formulated his "Easterlin Paradox". "Simply stated, the happiness-income paradox is this: at a point in time both among and within countries, happiness and income are positively correlated," he said. "But, over time, happiness does not increase when a country's income increases." 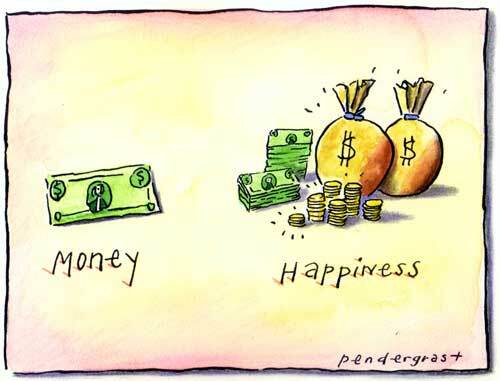 The Easterlin paradox suggest that in terms of human happiness -- a squishy concept to be sure -- there is a limit to economic growth beyond which there really is just no point in attaining more wealth. Further, a decoupling between income and happiness at some threshold would imply that GDP would not be a good measure of welfare, we would need some other metric. This conclusion has important implications for policy and for science. If raising income does not raise well-being, then policy should focus on goals other than economic growth. And given the central role of relative income, researchers have spent a great deal of time and energy understanding why relative concerns are so important. The accumulation of data over recent decades shows that Easterlin’s Paradox was based on empirical claims which are simply false. In fact rich countries enjoy substantially higher subjective well-being than poor countries, and as countries get richer, their citizens experience ever more well-being. What’s more, the quantitative relationship between income and well-being is about the same, whether we look across people, across countries, or at a single country as it grows richer. This fact turns Easterlin’s argument on its head: if the difference in well-being between rich and poor countries is about the same as the difference in well-being between rich and poor people, then it must be that absolute income is the dominant factor determining well-being. Their paper is non-technical and worth reading in full, also Derek Thompson at The Atlantic has a great summary. When scholars began studying comparative well-being in the 1970s, data was only available for a handful of countries. Consequently Easterlin (1974) failed to find a statistically significant relationship between wellbeing and GDP—although in fact the estimated relationship was positive. This failure to obtain statistically significant findings reflected the limited power of a test based on a small sample of countries, rather than a finding of a precisely estimated nil relationship. Indeed, Easterlin’s original data also fail to reject the null that the cross-country relationship equals the cross-person relationship (Stevenson and Wolfers, 2008). In other words he could reject neither the presence of the Easterlin Paradox nor the complete absence of any such paradox. I'd add to that explanation the fact that the Easterlin paradox fits in very well with a Malthusian, limits to growth world view. No doubt many have wanted it to be true, regardless of the data. Calls to replace GDP are common these days. Any such metric should meet the basic empirical test of doing better than GDP in its relationship with outcomes that people care about. Most proposed metrics fail this basic test. Ultimately, GDP will all but certainly remain core to efforts to measure well being. That said, there are important dimensions that it misses. Bringing those dimensions into view will not, in my view, be accomplished by inventing a better single metric, but by realizing that no one metric captures all that matters and recognizing that understanding well being is complex, multi-dimensional and involves trade-offs that people do not agree about. Multiple metrics will thus aid in both clarity and focus, and help to avoid the risk of experts seeking to impose their values on the broader community via stealth accounting. The Easterlin paradox, like many urban myths, won't be going away soon. However, research provides a compelling case that the paradox is empirically not supported. Money certainly isn't everything, but it does help to explain an awful lot.